In the past, Europe appeared to be the most intelligent and strongest continent in the world – mainly due to their colonization – i.e. the British Empire and Europe helping countries follow the European model of Industrialization. A book by two European academics listed the average National IQ for 190 countries. Not surprisingly, they found America right around the ‘average’ score of 100. Whereas they identified the mean IQ of mainland Europe to be 108 – above average. Calculating and identifying the Intelligence Quotient of nations has always, and will always be seen as highly controversial and extremely criticized. But they have ‘always’ been backed up with facts and figures. If you want proof that Americans are smarter than Europeans, find out for yourselves, but I'm not so sure. Literacy can always be an additional measure of Intelligence. According to the C.I.A. (and we all know how smart they are: intelligence is their middle name) - I am using this example for the benefit of the American readers - adult literacy in the United States is about the same as in Australia, and Canada. If you want to use higher education as your benchmark, the U.S. fares a little better than the other two examples; a 2005 study by the Educational Policy Institute showed the U.S. had the highest University attainment rate of 13 other countries, with 31 percent of those between ages 25 and 34 having completed a four-year degree. You have most likely noticed Europe was not used as a comparison for this example – this is understandable once you remember there is the likes of the Universities of Oxford and Cambridge in England, the University of Heidelberg in Germany, Paris, Rome…the list goes on. In America, all anyone associates with their education is Harvard and Yale. So there is not nearly as much comparison. Europeans are more intelligent and better educated than Americans due to the fact they are generally exposed to many different cultures at an earlier age. Europeans are thought to present themselves as better dressed and more ‘worldly’, unless they are from Scotland. Do Europeans have a better education system? Yes. Do they present themselves with more class? Yes. We all know people from Europe, they are the most sophisticated, well dressed and articulate people we meet. Especially if they are from England, Italy, France and Scandinavia. The cultural differences between Europe and America are vast. What Europeans do have, is a more realistic, relaxed life style. Life seems to be more appreciated than American's. Italians, for example, take several hours for lunch, have wine and rest. At the same time, many Europeans eat at their desks at work. Before the invasion of Fast food restaurants in Europe, they ate more sensibly than Americans. The average family in Europe lives a very simple life with few luxuries. Americans are very materialistic. They are in need of the latest gadget, the newest car, the biggest house. Okay. Now the ‘boring’ factual stuff to back up the arguments. 4. The hereditary factor of IQ, all have contributing factors toward the intelligence of nations and individuals. (Readers seeking a more extensive summary and for a complete discussion of how brain size and IQ explain much of human behaviour and are in turn explained by human evolution can perform further independent research of their own). 2. The relationship between intelligence and brain size. Using Magnetic Resonance Imaging (MRI), constructing three-dimensional models of the brain, shows a positive correlation between brain size and IQ, as replicable a set of results as can be found in the social and behavioural sciences. 3. The parallel geographical distribution of brain size. A recent MRI study found that people of American background averaged a smaller brain volume than did those of European background. 4. The heritability of intelligence. The heritability of intelligence, as critically analysed from numerous studies, finds IQ about 50% heritable. So if your own IQ is not that high, you know which continent to send your children to be educated. 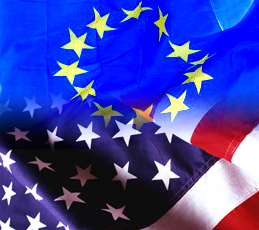 Even though the reports provided studies analysed and general thoughts and feelings from nations around the world, the results of Intelligence between Europeans and Americans is much closer than it appears. No-one should feel disheartened. No-one should feel upset. No-one can help where they are born. We all deal with our situations as best we can. 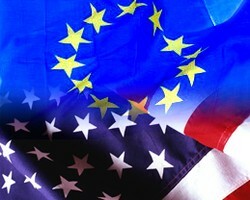 Relations between Europe and America have never been as strong as it is today, and it will only continue to grow and develop for many decades to come.